I was asked why children as young as 2 be introduced to scissors. My answer is that scissor skills is a highly developed skill for children to acquire. It involves fine motor skills of the fingers, hand eye coordination and right-hand left-hand coordination. 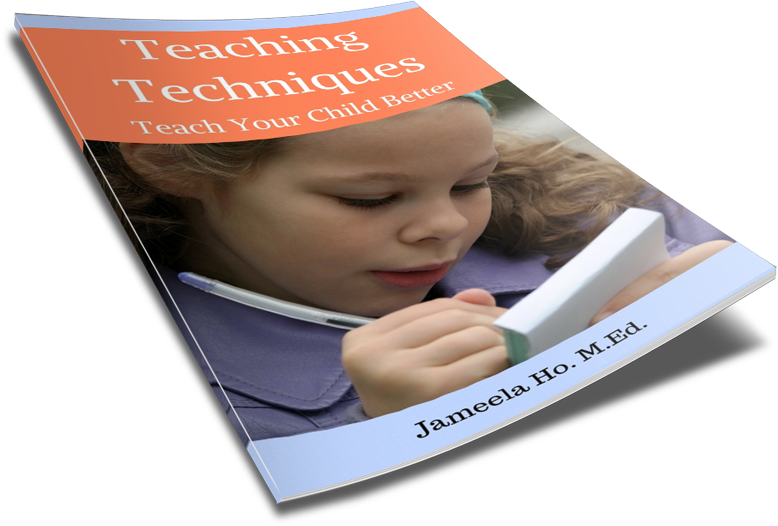 The first two skills are helpful for developing children's handwriting skills. 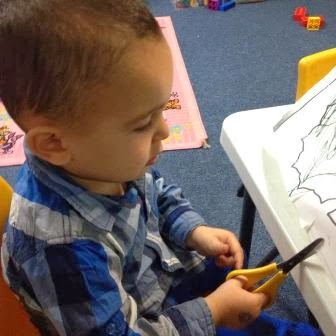 This little boy is 2 years old and this was his second lesson in using scissors. When I first gave him a pair of scissors and position it correctly in his hands, he started to snip the paper that I held out for him. With his first snip, his face was full of wonder. He must have felt "Like wow! Did I do that?" Ever since that day, he would always request a pair of scissors. Look at his face - he is full of concentration. At this stage he cannot coordinate both hands, so his left hand is in mid space as he focuses all his concentration of his right hand. When he is confident in using his right hand to control the scissors, I would teach him to use his left hand to hold the paper. 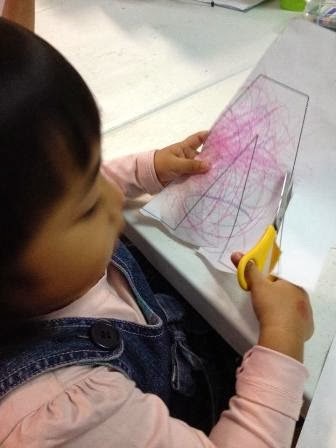 This little girl is 3.5 years old and she has been using scissors since she was 2 years old. She has full control of the scissors. Her cutting skills is highly developed, masha Allah. I must stress that when using scissors with young children, all care must be taken. They need close supervision with one on one. The books below contain lines and pictures for children to practice their cutting. I use similar books when I need certain things that I want children to cut. Ok! This is really interesting! Nope never too early for anything. Just need a dedicated mum or teacher.